Gillete defends image of plus-size model after being accused of promoting obesity. 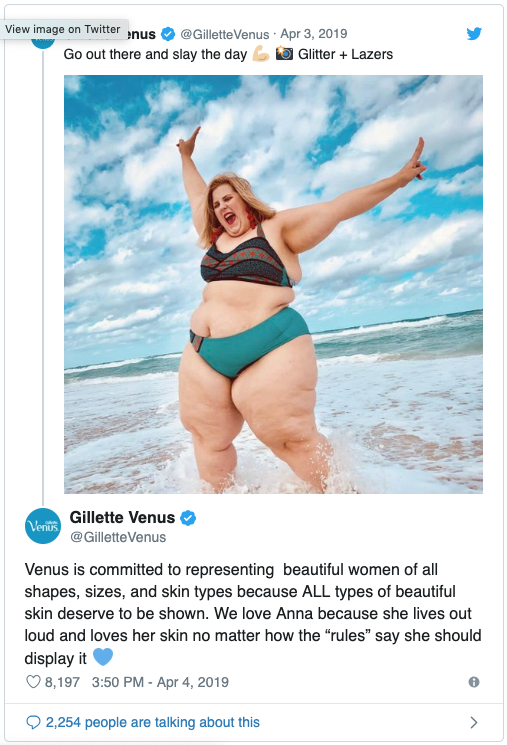 Last week, Gillette went to bat defending their twitter post showing a plus-size model in a bikini at the beach. After posting, they were immediately bombarded with accusations of promoting obesity and unhealthy lifestyles. Read the comments for yourself, they are brutal. At the end of the day, a strangers’ health is none of your business. It is between them and their doctor. Since when has shame been a healthy motivator for anything? Women have always been told that their worth is contingent on the status of their body: can it bear a child? can it do free labor? can it please a man? can it work a 60 hour work week and still look fit, fresh, ready (and smiling) come Monday morning? Let’s all agree that women’s bodies belong to them - and that their health, appearance, and ability is none of your business. Just let her live, and god forbid, choose to love herself unconditionally.